A wonderful gift for the holidays. Dorothy's gift baskets are stunning! 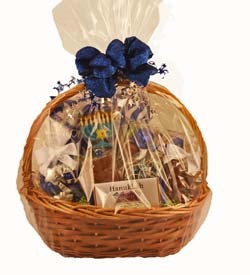 This blue and white filled basket of holiday good wishes is no exception. The hand-painted Hanukkah chocolate lollipop conveys perfectly your wishes for light and prosperity -- so suitable for this special week.